Whether it is for a dishwasher, an oven, or any home appliance in between, if you work in the appliance manufacturing sector, it is important to utilize custom parts to differentiate your appliances from the competition. 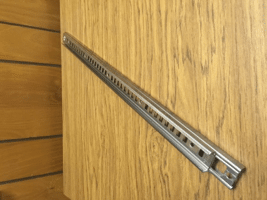 Roll forming can be used to make parts throughout the appliance sector, including but not limited to refrigerator panels, shelving, dishwasher rack tracks and decorative trim. A customer in appliance manufacturing wanted to increase the space within the dishwasher rack track for additional dishes. Working in conjunction with their design engineers, Roller Die + Forming came up with a low profile mechanical locking mechanism that met the customer’s requirements and enhanced the features of this dishwasher. The profile of the track is much more compact than previous models thereby giving move space in the trays for dishes and utensils to be washed. The track is currently in production and in use in the customer’s dishwashers. Another customer came to Roller Die + Forming needing a heat diverter for the oven on a free standing range. The original part was roll formed and the sweep was stamped as a secondary operation. The secondary operation left a burr that could possibly cut someone cleaning the surface of the range. With the help of Roller Die + Forming, the method of manufacture was changed to a stamping which eliminated the burr issue. For more than 85 years, Roller Die + Forming has been a leading producer of standard and custom roll formed parts, serving customers throughout the United States, Canada, Mexico and all over the world. We are dedicated to providing quality roll formed parts and unmatched customer service. 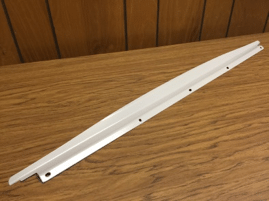 If you are an appliance manufacturer in need of roll formed parts, contact us today.